9% Growth in Housing or a 4% Loss? 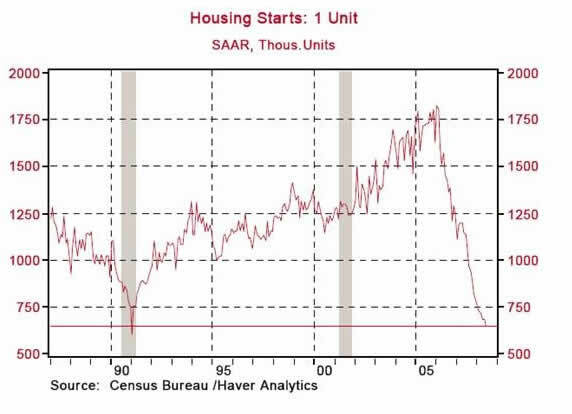 Housing starts rose 9% and the market cheerleaders proclaimed that we have seen a bottom. But not if you look at the actual numbers. New unemployment claims were OK, but not if you look at the actual numbers. And inflation was simply ugly, no matter what numbers you look at. However, oil is down and there is reason to think it may have further to go on the downside. We cover all this and more, as we first look at why the world is not going to end. It is easy to find bad news these days, and the torrent that seems to keep coming can ruin a person's summer (or winter, for my southern hemisphere readers). The credit crisis, as noted last week, is nowhere near an end. Housing, as we will see, is actually getting worse. Foreclosures, auctions, government bailouts, higher taxes, inflation, the price of energy and food - the list goes on and on. I thought, since so many think of me as a rather bearish person, I would show you my more optimistic side. Yes, I am bearish in the short term, for reasons I have documented at length in this letter. But long-term I am a wild-eyed optimist. With all the negative news thrown at us today, why is the United States not in the midst of a deep recession? How, many of you ask, can I be so sanguine as to suggest a milder recession and a Muddle Through Economy? First, things are somewhat different now than in the '70s and early '80s. Back then, a great deal of the US and developed world economies and their resulting employment were linked to manufacturing, which was largely geared to domestic sales. Exports were a much smaller part of the economy for most businesses. When the economy and consumption slowed down, manufacturers laid employees off rather rapidly. Unemployment would soar and a V-shaped recession would occur. Now, the number of people employed in manufacturing is less in percentage terms than it was back then, and more of what is produced in the developed world is bought by a growing developing world. Exports from the US are booming. The number of TEUs (the large containers on ships: Twenty-foot Equivalent Units) moving through the ports of Los Angeles and Long Beach is up 23% in May year over year and up 26% since the beginning of the year. Because of the weak dollar, imports are down by 7% year to date. It is export growth that is keeping the US from sliding into the usual deep recession. So, not only is manufacturing not down as in usual cycles, it is up quite handsomely for many products, except of course for automobiles, which are not just in a recession but facing a depression. But that growth in exports is keeping unemployment from going to 9%. But let's take a longer-term outlook. My view has been, and is, that we are in for a period of very tepid growth that will last through at least 2009. We have to work our way through the after effects of the twin bubbles of housing and the credit crisis bursting. There is no magic Fed wand. That simply takes time. No (rational) government or Fed policy is going to change the facts on the ground (although they can make things worse). But, in the fullness of time, we will in fact get through this. If you look back over the decades, things are getting better. Goldman Sachs estimates about 70 million people a year worldwide are entering the "middle class" and that by 2030 two billion people will be in a far better condition than the poverty they experience today. That will also keep demand steady for all sorts of products and services produced in the developed world, even as our population (except for the US) declines. The old joke is that a recession is when your neighbor loses his job and a depression is when you lose yours. And a rise in unemployment and lower corporate profits are no laughing matter. But the simple trend is that we will adjust and free markets in America and the world will grow, as they have always done. My daughter and business partner Tiffani is getting married in three weeks on 08-08-08. Next year there will be 2.3 million weddings in the US, at an average cost of $30,000 (we have helped increase the average this year considerably). That is $72 billion on weddings. And many of those new families start with the need to find a place to live, furnish a home, and build their nest. Tiffani and her fiancée are an example. 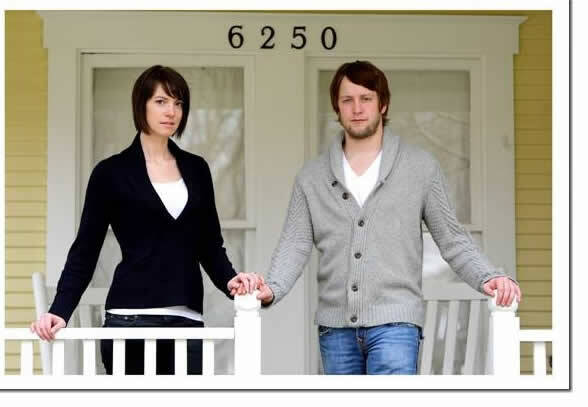 They have bought a home at a pretty good price in an older neighborhood that is fast becoming trendy, as there are a lot of wonderful restorations and teardowns. They have lived rather simply and find they "need" all sorts of items to make their house a home. Each day sees another delivery of gifts from their registry and a smile on her face. Last year a record 4.3 million babies were born in the US. Each of them will need all sorts of "stuff" - food, education, and places to live - in (hopefully) 20-25 years. Yes, consumers are cutting back, but they are still buying the basics. (See more below.) Manufacturing in the US is starting to make a comeback, with the lower dollar and management driven to compete globally. In free-market economies, every economic slowdown is followed by a period of solid growth driven by innovation. The point is that life goes on. Births, weddings, eating, living and enjoying friends and family. It is all part of the cycle. The next 20 years are going to see the most powerful wave of technologically driven growth the world has ever seen. The accelerating pace of technological change did not slow down last century through multiple world wars, scores of "minor" wars, a depression, all sorts of natural disasters, and an unbelievable amount of government folly. Why should that trend stop now? As we add two billion people to the middle class, we are also going to bring the internet to even billions more. The explosion in information and creativity that we have seen in the last 20 years will double and double again. A small percentage of those people are going to invent amazing new technologies, new drugs, and create companies that will make life better for all of us. That is one reason that technological growth will continue to accelerate. We will simply be throwing more people at an ever wider array of problems, and they will be able to share their discoveries at the speed of light. We are on the verge of a revolution in biotechnology that is going to truly revolutionize medicine. No one in 20 years will look back on today as the good old days. And it will probably create yet another stock market bubble, but that is a story for another letter. US diplomats are talking to Iran. Iraq may actually work out. In most places of the world, most people are better off today than they were 20 years ago. There is still a lot of progress to be made, but the point is that we are making it. There is a ton of opportunity for those prepared to look for it. It may not be in the usual places, it may not be where we would like it to be, but it is there. World GDP will have roughly doubled (or more) by the end of the next decade. Yes, I know there are a lot of problems. Really big scary ones. I write about a lot of them all the time. But go back to any year ending in 8 for the last 100 years. When were there not problems? And in most times and places, the problems were bigger. And in the next ten years? There will be lots of problems. Some will be the same old problems and some will be new. I am not certain why mankind seems to have a need to find new ways to create mischief and lose money when the old ways work so well. But those too will pass. So, when you read about current problems - and I will point some out in the next few pages - just remember that things will work out. Markets will adjust, and the world will be a better place. Things will work out better for you as an individual if you anticipate the problems and make the proper adjustments, as much as possible, in advance. The next 20 years are going to be the most exciting time that the human race has experienced. Yes, there will be issues, but we will adjust. That is what we do. And now, let's look at some of the adjustments going on in the markets. When the news flashed on my screen that housing construction had jumped by 9%, I raised an eyebrow. That did not make sense given other data I was looking at. Immediately the media was full of talking heads and stories about the turnaround in housing and the end of the slowdown. I must admit to being a little confused. Then we find the rest of the story. Asha Bangalore from Northern Trust actually took the time to read the details. It turns out that New York City had a change in its construction codes, and that affected what is considered a housing start in the Northeast, especially in multi-family construction, which "jumped" 42% because of the code change. If it were not for the change, housing starts nationwide would have fallen by 4%. Because of the code change, housing starts jumped 102% in the Northeast. However, single-family starts nationwide declined 9.3% in June, to an annual rate of 647,000 units. That level of single-family starts is the lowest since January 1991. Look at the following chart from Northern Trust. Does this look like a 9% increase? Each week we see a release of initial unemployment claims. This week initial claims jumped to 366,000 on a seasonally adjusted basis. But what are the real underlying numbers? Every Thursday, I get a thorough review of the actual data from John Vogel, going back and looking at trends over the past 8 years in the non-seasonally adjusted data. That can be more interesting. This week the actual number of initial claims of unemployment was 475,954, compared to 383,839 last year (2007). And the number of actual claims has been trending up. Taking the three first weeks of the current quarter, we are still below the recession years of 2001-3; but the trend is not what you would like to see, and given the decline in consumer spending (see below) it is likely to continue to trend up. The actual data is very "noisy" and jumps all over the place, hence the use of seasonally adjusted numbers for public consumption. Economy.com thinks the difficulty may be in accounting for auto-related plant shutdowns in the seasonally adjusted number. Vogel speculates that employers are no longer waiting until the end of the quarter to lay personnel off but are doing it at any time in the quarter. Given the issues, it is likely we will see a rise in the number back toward the 400,000 range (SA) that we saw earlier last month. But just be aware that there can be something really different in the actual numbers. Below is a graph from economy.com showing where the employment problems are. 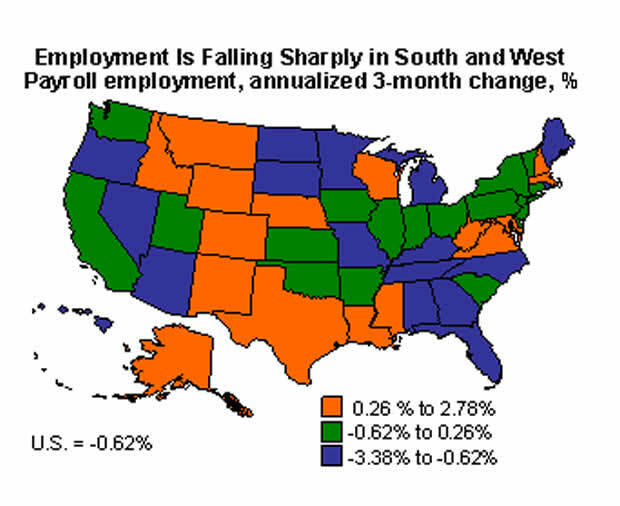 The majority of the states are seeing payroll employment drop. Fannie and Freddie and Bears, Oh My! Let me see if I have this straight. It is OK to short oil but not OK to short Fannie Mae? Or is it that it is OK to be long Freddie Mac but not long oil? Oh, those evil speculators. As Barry Ritholtz points out, why is it that management blames speculators when their stock is being pummeled, when the usual reason is that management made some very bad decisions? And let's not forget the importance of rumors. We all know rumors can bring down a stock. So, let's start one. Let's start a whisper campaign that Goldman Sachs is going to have to take down $100 billion in losses next quarter, and then we can all short the stock. What would happen is that we would all lose our money when we had to cover, because there was no basis in fact. The best way for a company to deal with short selling is to increase earnings and blow the shorts out of the water. Good management trumps rumors. This week the SEC has made it more difficult to short Fannie Mae, Freddie Mac, and other large financial firms. They are actually going to enforce the rule already on the books that says you must actually be able to deliver the shares you are shorting. "Naked" short selling has been against the rules for some time. (That is, short selling a stock that you cannot actually borrow to sell.) Institutions make rather tidy sums offering the shares they own to short sellers for a price. Making it more difficult to short Fannie or Freddie is not going to do one thing for their balance sheets, which is the real source of their problem. As former Fed governor William Poole said a few weeks ago, they are basically insolvent. Five-year bonds sold by Fannie Mae yield 90 basis points (0.9%) more than US Treasuries of similar maturity, almost double the average over the past 10 years, according to data compiled by Bloomberg. That spread, which translates to $90,000 in extra annual interest per $10 million of bonds, exists even after Treasury Secretary Paulson signaled the US would ensure the debt is repaid by offering larger amounts of backup financing and potential capital infusions. Given Paulson's guarantee, why would you buy US bonds when you can get the same guarantee and almost 1% more? Fannie and Freddie are private companies where the profits go to shareholders and losses go to taxpayers. There are a lot of people (including your humble analyst) who have complained about the current set-up. Basically, they were allowed to leverage their capital beyond what even your most leveraged hedge fund would think prudent. How could the value of homes go down? Leverage up and show huge profits, pay monster salaries and bonuses to management who did nothing but increase risk, and spend $170 million on lobbyists to make sure that no one changes the rules. Paulson had no realistic choice but to do what he did. But the true point is, he should have never had to make that choice. A real regulator would not have let them leverage their capital to the extent they did. If taxpayers have to invest one penny before shareholders are wiped out, then there is no justice. Fannie and Freddie should be broken up into several much smaller firms which are not too big too fail, their shares floated to new owners, and taxpayers should get preferred shares until they are made whole. And the implicit, but now explicit, guarantee should be taken away. And while we are on regulators, it is time for Bernanke and Paulson and SEC chairman Cox to force the credit default swap (CDS) market to move to a regulated exchange. If there is a major risk to my happy news scenario at the beginning of this e-letter, it is the credit default swap market collapsing. That is why Bear Stearns had to be rescued, and why other firms like them are too big to fail. If the CDS markets were on an exchange like any futures contract, Bear could have been allowed to fail. It would have been a sad day, but the Fed would not have had to risk $30 billion. Greenspan was wrong when he said these derivatives did not need to be regulated. They are good for the markets, and I think they are necessary. But let's put them on an exchange where there is clear transparency and the entire economy of Western Civilization is not put at risk by some cowboys who decide to leverage up. This is my first really big wedding. As I said, it is as carefully planned as the Normandy invasion and about as expensive. I can really understand now when brides talk about stress. But poor Tiffani has had a triple dose. She moves next week into their new home (kind of). But then, there is not a lot to move. But then the real stress started a few weeks ago when FINRA (the former NASD) called and said it is time for an audit. We get one about every 3-4 years. It is about as stressful as any part of the investment business, and Tiffani has to deal with 98% of it, as Dad is clueless. So, she has spent very long hours getting ready for the audit. Yesterday, after three and a half days, we had our exit interview, and it went about as well as we could have hoped. But the timing would have been better either earlier or after the honeymoon. Oh, well. We have had an audit from some regulator every year for the last five years. Just part of the business, but it does create some stress. We are due for an NFA audit sometime soon. I just hope they do not come when Tiffani is on her honeymoon in some fairly remote places in South Africa. It is time to hit the send button. I see a Batman movie with the kids in my future. It should be a great weekend. I really enjoyed your "The World Will Not End" commentary.